Habit: Plants rosettes or hanging clumps, green. Stem: 10--20 cm. Leaf: generally 5--12 cm, flat; sheathing bases glabrous; leaflets 2--3 per side, separated, 5--20 mm, +- round, evenly toothed or lobed < 1/2 to base; cauline leaves 0--2. Inflorescence: open, generally 3--20-flowered; pedicels 5--30 mm, generally +- S-shaped in fruit. Flower: 7--10 mm wide; hypanthium length < 1/2 width, bractlets generally 0; petals 2--3 mm, < sepals, narrow-oblanceolate, yellow; stamens 5--10; pistils 4--10. Fruit: 1.5--2 mm, +- ridged, pale. 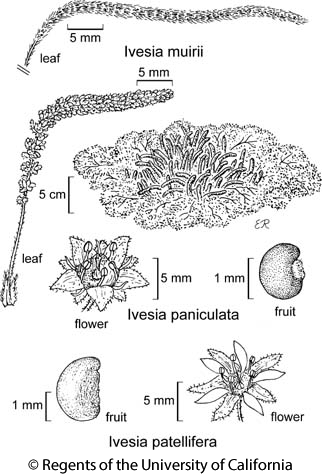 Citation for this treatment: Barbara Ertter 2012, Ivesia patellifera, in Jepson Flora Project (eds.) Jepson eFlora, http://ucjeps.berkeley.edu/eflora/eflora_display.php?tid=29454, accessed on April 24, 2019. No expert verified images found for Ivesia patellifera. e DMtns (Kingston Range). Markers link to CCH specimen records. Yellow markers indicate records that may provide evidence for eFlora range revision or may have georeferencing or identification issues. Purple markers indicate specimens collected from a garden, greenhouse, or other non-wild location.